This is my third winter with Dahlia. The first winter I had her I discovered something about my neighborhood. Many people don't bother shoveling their sidewalks. This may not seem like a really big deal but trust me, when you're trying to walk down those sidewalks it's a really big deal. Often I was trudging through snow a foot or two deep or walking on snow that had been unevenly packed down by many people walking on it. And then the worst thing happens. It gets above freezing, the sun comes out. That snow melts a bit and then at night it gets back below freezing and all that water on top of the snow becomes ice. The first winter I had Dahlia I slipped on that ice multiple times. I fell a handful of times, though I never really hurt myself. The following winter one fall wrenched my ankle really good and while it wasn't broken or sprained, it was sore for a few days. Another time that second winter I fell and landed with most of my weight on one elbow. I'm sure I tore something in my shoulder on that one and I still sometimes get pain from that fall. I've never done any major damage but I'm all too aware that it's a possibility. Fall enough times and one time you will really hurt yourself. The last thing I need is a broken bone! Last winter when I was hobbling around a neighbor of mine said "You really ought to get YakTrax." She told me they would make walking on the ice really simple and much more stable. She hadn't fallen since she had picked up a pair. I was skeptical. Who wouldn't be? I've been walking on snow and ice all my life with boots of various traction levels and none kept me 100% upright. But I picked up a pair that was on sale at the end of last winter anyway. I got them for $15 (they retail for $20) so I figured even if they helped a little bit, they would be worth the investment. This winter I used them. And I was amazed at how much they helped. Since the snow began falling on December 4, my little city has gotten over 70 inches of snow and the sidewalks are covered with ice and snow. My YakTrax have gotten quite the workout and I can tell you this much: I have not slipped or fallen, not even on the worst of the ice. I do not get any money for endorsing this product. This is just from one dog walker to anyone who happens to read this blog. 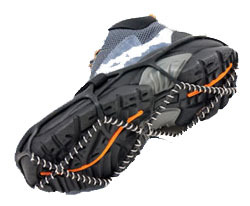 If you live in a snowy or icy area, get some YakTrax. I just have the basic Walker model, but they also come in a Pro model for people who do running or spend more time outside and an Extreme model for people who go into deeper snow and harder areas. You can buy them direct from their website or find a retailer near you that sells them. Trust me. You won't regret it! Oh, so THAT'S what those are. I saw a pair of boots someone left at work with the "XTR Extreme" on them. Chains on your shoes! Genius! We don't even have sidewalks where I live, so we're kind of sticking to walking in the middle of the street. The sides are covered in slush that's frozen over into lumpy spikes of doom that really hurt Humphrey's paws. Yay Wisconsin! Poor Humphrey! The frozen slush like that is the worst. Our neighborhood has sidewalks and the worst we deal with is ice, but usually it's just smooth and slippery instead of spiky!